This 1948 residence by renowned architect R. Harold Zook illustrates the persistence of the Arts & Crafts motif well into the middle of the 20th Century. It was Zook’s last commission and was his last home to be occupied by its original owner. The unique structure of horizontal fieldstone is the work of Italian stonemasons. As the Aichinger family grew, those same stonemasons returned to work on the home’s northerly expansion, maintaining a visual continuity with the original structure. Zook’s signature spider web pattern appears on the living room fireplace and his favorite chevron design is featured on the walls of the den and on the garage door. 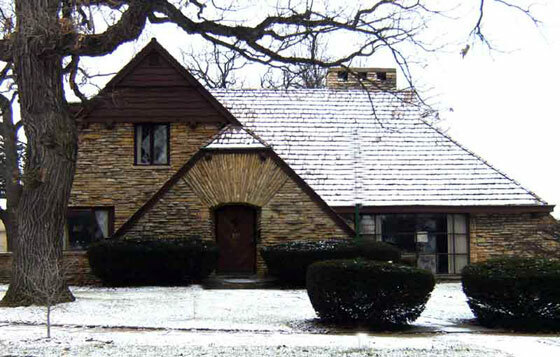 A local landmark, the home is listed on the Illinois Historic Structures Survey.